1-CD with 48-page booklet, 25 tracks. Playing time approx. 65 mns. "Mitch Miller said to Wesley Rose, 'Ol' Hank William's done it again, hasn't he?' and Wesley Rose said, 'That was Curley Williams who wrote Half As Much, and Mitch Miller said, 'Who's Curley Williams?' and Wesley Rose said, 'A guy that's been on your label about seven years.'" And there, in a nutshell, was Curley Williams’ dilemma. He was on the Grand Ole Opry before Hank Williams; he was on the Louisiana Hayride before Hank Williams; he was a recording star before Hank Williams … but few remember him today, except for writing one of Hank William’s biggest hits, Half As Much. These two volumes are a retrospective of the great, and vastly underrated western swing star Curley Williams. Rarely reissued on microgroove, and never reissued on CD, these two CDs are a treasure trove of oh-so-fine sharp-tip western swing music. So few have heard of Curley Williams, much less heard him, but he’s on a par with the very best western swing bandleaders of the 1940s and 1950s. If you like Bob Wills, Hank Thompson, Hank Penny, or Spade Cooley, you’ll be sure to love Curley Williams. They cover his complete Columbia recordings, include all his early recordings from 1945 to 1952, as well as ultra-rare demos with Hank Williams of Time Has Proven I Was Wrong and No, Not Now. 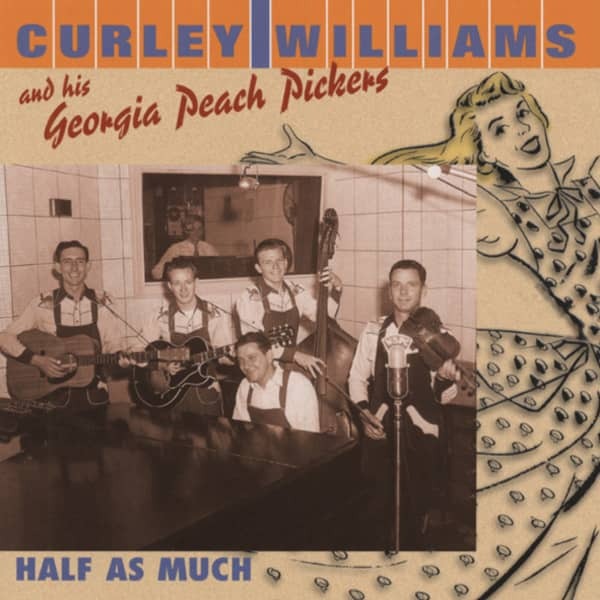 Curley Williams went on to work with Hank Williams and write one of his biggest hits, Half As Much, but here he proves convincingly that he’s much more than a footnote to the Hank Williams story. 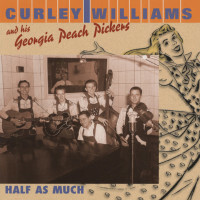 This collection and its companion ('Just A-Pickin’ And A-Singin’,' BCD 16326) gather the complete recordings of Curley Williams & his Georgia Peach Pickers, made for Columbia Records between 1945-1952. 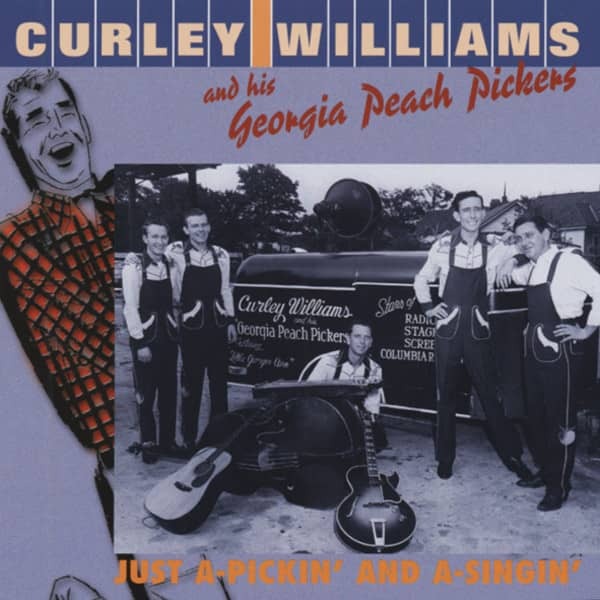 In addition to all of Curley’s released performances, all his and the Peach Pickers’ previously unissued titles are all issued for the first time in these volumes. Added to this body of recordings are a handful of heretofore unreleased alternate takes and two demo recordings made by Curley and his friend Hank Williams of songs the two wrote while working together in Shreveport in 1948-1949. 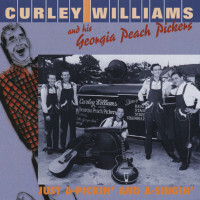 'Just A-Pickin’ And A-Singin’ ' traces Curley’s recording career from his first session in 1945 through the end of 1947, while the selections on this second CD are from the period between 1949 and 1952 and, in addition, include a selection of alternate cuts made between 1946 and 1951. Curley Williams was born Dock Williams, on June 3, 1913 (some sources claim 1914, although Curley’s application for a Social Security card states 1913), on a farm located in the Lime Sink Militia District of Grady County, in south Georgia, near the town of Cairo, less than 20 miles from the Florida line. Curley, one of eight children, was the seventh son born to a country fiddler who was also the son of a country fiddler. Curley’s parents, in observance of the old adage that a seventh son was destined to become a doctor, considered it appropriate to christen their seventh son Dock. Curley who, like his father and grandfather, became a fiddler rather than a doctor, proved that the old saying has its exceptions. Three of Curley’s brothers also became musicians and, at one time or another, all three of them, Sanford, J. D., and Joseph, were members of Curley’s bands. Playing a fiddle that belonged to his grandfather, Curley picked up his first gigs providing music for dances in South Georgia. Making music was a sideline, however, as the Williamses earned their living raising cotton and corn. Musicians of the 1930s and 1940s who had aspirations for a career in country music had to have radio exposure. Every town of appreciable size had a radio station and most of them featured one or more hillbilly bands. Curley and his group, then called the Santa Fe Trail Riders, made their radio debut on WPAX in Thomasville, Georgia, around 1940. Like almost all country music groups of the time, Curley and his band changed radio outlets periodically, always in search of new and larger audiences. Curley’s stint at WPAX (250 watts) was followed by jobs on two other South Georgia stations, WMGA (250 watts) in Moultrie and the much more powerful WALB (1,000 watts) in Albany. 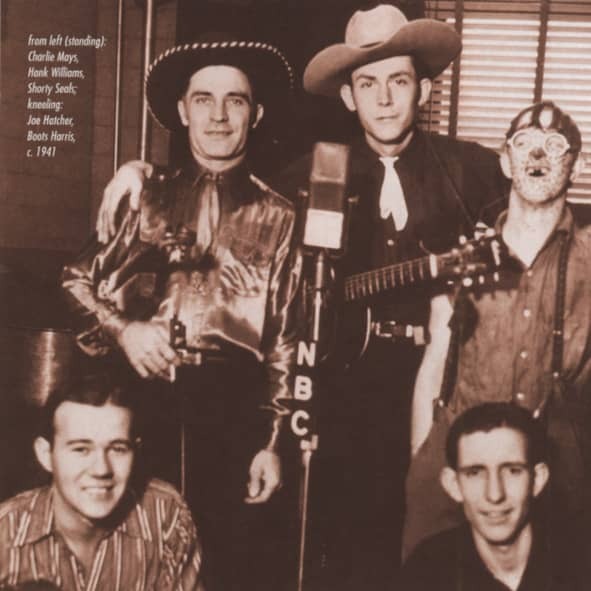 In December 1942 Curley took his band to Nashville, Tennessee, where they joined the cast of the Grand Ole Opry, the prestigious Saturday night country music radio/stage show that had been heard on radio station WSM since 1925. The band that performed on the Opry consisted of Curley, vocals and fiddle; Joseph Williams, rhythm guitar; Sanford Williams, bass and comedy; Clyde 'Boots' Harris, steel guitar; and Joe Pope, piano. They were later joined by Jimmy Selph on vocals and guitar. Boots Harris had joined Curley’s group earlier in the year at Albany, Georgia. Harris was working with Hank Williams whose band was on tour backing Tex Ritter when they played a date in Albany that also included Curley and his band. It was then that Harris, who was 18 years old, decided to cast his lot with Curley. Prior to joining the Grand Ole Opry cast, Curley had been known professionally by his real name, Dock. The name Doc Williams, however, had been in use since 1936 by Andrew Smik whose band, the Border Riders, was a headliner act on the WWVA Jamboree in Wheeling, West Virginia. To avoid confusion, Grand Ole Opry manager, George D. Hay, suggested that his new artist take the name Curley, because of his curly hair, and call his band the Georgia Peach Pickers, since most of the members were from Georgia. Curley Williams and the Georgia Peach Pickers were heard regularly on the Opry on the 9:00 to 9:30 segment sponsored by Royal Crown Cola and on the 10:15 to 10:30 portion for such sponsors as Weatherhouse and Walrite. From time to time they also made appearances on the show’s other time slots, including the NBC network show sponsored by Prince Albert Smoking Tobacco. Their musical offerings included songs like There Is No Love To Die, Smoke On The Water, Hang Your Head In Shame, and instrumentals such as Blue Steel Blues, South, and Steel Guitar Twist. While on the Opry, Curley and his Georgia Peach Pickers worked with such artists as Curley Fox and Texas Ruby, the Cackle Sisters (Carolyn and Mary Jane De Zurik), Paul Howard and His Arkansas Cotton Pickers, Zeke Clements, Pee Wee King and the Golden West Cowboys, Bill Monroe, Roy Acuff, Minnie Pearl, and Ernest Tubb. Customer evaluation for "Just A-Pickin' And A-Singin' (& Georgia Peach"